UFC superstar Conor McGregor has not competed inside the octagon since his title earning victory over Eddie Alvarez back in 2016. That being said, the fighter has been biding his time with other ventures. “Notorious” made his professional boxing debut back in August. For the fight, McGregor faced off against undefeated pugilist legend Floyd Mayweather Jr. in one of the year’s most highly anticipated combat sports events. While McGregor suffered a TKO loss to his opponent, the UFC lightweight champion still walked away with the payday of his career. The fighter earned an alleged $100 million for his debut in boxing. It would later be revealed that the event broke the pay-per-view sales record previously held by Mayweather vs. Pacquiao. All of that in mind, Conor McGregor is now looking to make a return to the octagon. Grant it recent USADA logs, as seen below, have revealed that “Notorious” has not been tested by the anti-doping program for 18 weeks. 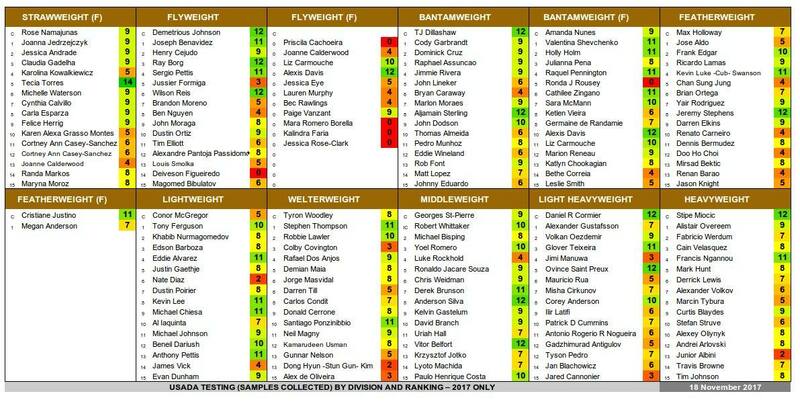 Under their drug testing guidelines, fighters are subject to random testing both in and out of competition and also need to disclose their whereabouts at all times.